Light a candle and watch this Embossed Blue Lantern come to life. You’ll love the embossed glass details and the vibrant jewel tone of the glass. Lantern measures 15H x 9 in. 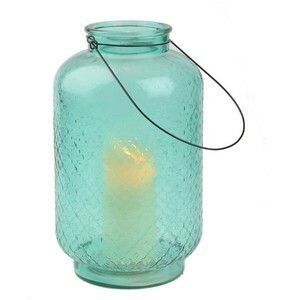 in diameter Crafted of glass Blue glass finish with embossed details Metal handle Accommodates one (1) 3 in. pillar or sphere candles; candles sold separately Care: Dust with a soft, dry cloth. Safe for covered outdoor use.